SIGNED Initialed by Edward Weston. With the Scarce Dust Jacket. Texts by Weston, Merle Armitage, Robinson Jeffers, and Donald Baer. Duell, Sloan & Pearce, New York, 1947. With the very scarce dust jacket. 1160 in a limited edition of 1500. 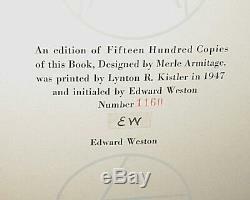 SIGNED with initials by Edward Weston on colophon page. 50 black and white reproductions. Good plus in a good dust jacket. Though [50 Photographs] includes all of Weston's genres--landscapes, nudes, still lifes, and portraits--it is an unusual selection, more edgy than iconic...-David Levi-Strauss in Roth, et. The Book of 101 Books. Boards show moderate wear to the edges and corners. Silver lettering on the spine still bright. Internally, front hinge partially split. DJ with moderate wear and some small tears to edges and to the top and bottom of the spine as well as some creasing. Light chipping to corners and edges. Large chip to the head of the spine. 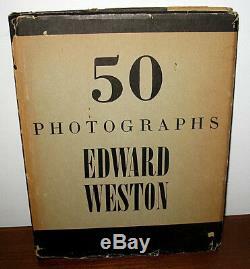 The item "SIGNED Numbered Edward Weston 50 Fifty Photographs Limited ED Dust Jacket HC" is in sale since Wednesday, June 19, 2013.